NEW – A student can leave class/school ONLY if the following has happened: a note has been turned into the Attendance Office or a parent has emailed HDVattendance@hboe.org and the student has an early dismissal pass. ALL EMAILS AND NOTES FOR EARLY DISMISSAL SHOULD BE IN BY 10:00 A.M. FOR SAME DAY DISMISSAL. Students no longer have to sign out if they have an Early Dismissal pass. The student can show their pass to their teacher at the designated time and then exit the building. If returning, the student must sign back in so their time can be adjusted. This applies to those who are 18 and older as they cannot sign themselves out. Parents are still the authority while the 18 year old is in school. Teachers will not dismiss students based on a personal text or call to a cell phone. Students who are ill during the school day should report to the Clinic to be evaluated. Parents will be contacted by the nurse. Any student who arrives tardy without signing in at attendance, or leaves the building without advanced parent consent will be marked unexcused and considered truant. This will result in a detention. Early dismissals the day before long weekends or holidays must be turned into the attendance office no later than the school day prior to the early dismissal day. This includes whether the student is leaving for the day, has an appointment, or is leaving and coming back. If not, the note will need to be approved by a principal or a parent/guardian will need to come to school to sign the student out. Excused absences: doctor appointments, illness, etc. Unexcused absences: oversleeping, alarm, traffic, car issues, no check in/out at attendance, etc. Unexcused Reason: This code is used when we have heard from a parent/guardian, but the reason does meet the criteria for an excused absence, or when a reason is not left on the voicemail. It will prevent you from receiving a phone call that day. Examples: oversleeping, traffic, car issues, Drivers Education in-cars, Drivers License test, forgot iPad or cell phone. weather is bad, etc. Official Absences: Approved vacations, funeral (3 days bereavement for immediate family member and an obituary may be requested), doctors note, college visit letter, or court document to make the time missed “official”. “Official” days out still calculate for HB410 hours, per state of Ohio law. Vacation Form – students can use this form for a one time per school year, maximum of 10 days that will be marked VAC/Official. The form is located on the district website as well as in the Attendance Office. Please turn in two weeks prior to the event, if possible. 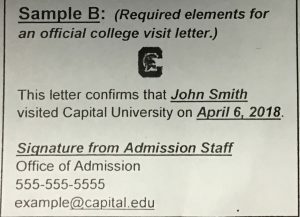 Please note: Seniors must have their college visits completed by May 1 to be “official”. If your student has a chronic illness (i.e. IBS, Juvenile Arthritis, Epilepsy, Panic Disorder, etc) please have your doctor provide a note stating the student’s condition and that absences relating to that condition be officially excused for the current school year. If your student would get the flu, etc. that would not fall under the official excuse for the condition. A new letter for each school year is needed. An absence can only be classified as official if a note from a doctor, dentist or legal representative is brought to the attendance office or faxed within three days of returning to school. Fax number for Hilliard Davidson Attendance: 614-921-7241. A note or email must be received by the attendance office prior to a student leaving. The note must be signed by a parent or legal guardian, include the student’s full name, the date and time of early dismissal, and a phone number where the parent or guardian can be reached for confirmation. Once receiving this note/email an early dismissal pass will be issued to the student. In case of an emergency, a parent or guardian must come to the attendance office and sign the student out of school. A student missing one class period or less on an early dismissal will not be counted absent on the daily attendance record. Students missing 2 to 3 class periods will be counted absent a half day. Students missing 4 or more class periods will be counted absent a full day.